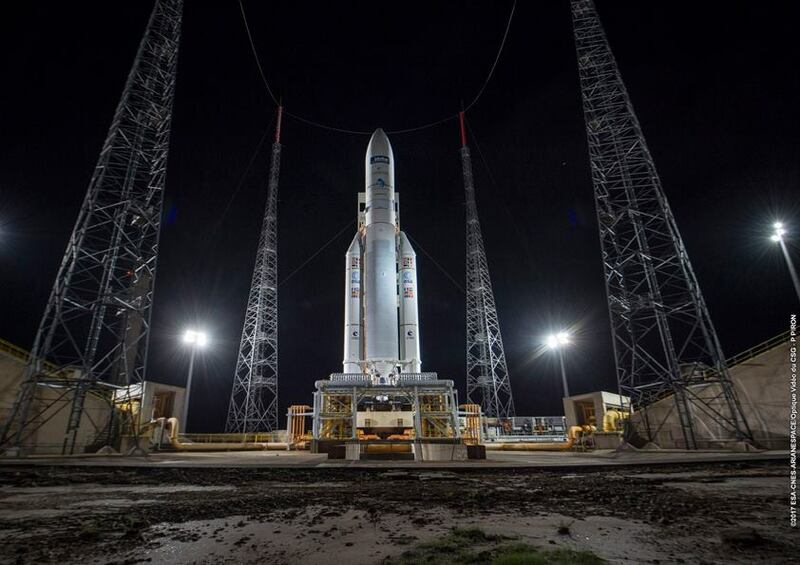 Europe’s Ariane 5 workhorse lit up the night skies over the edge of the Amazon Thursday night, rumbling into orbit on a record-setting mission with a pair of high-power broadband satellites for the United States and Europe. 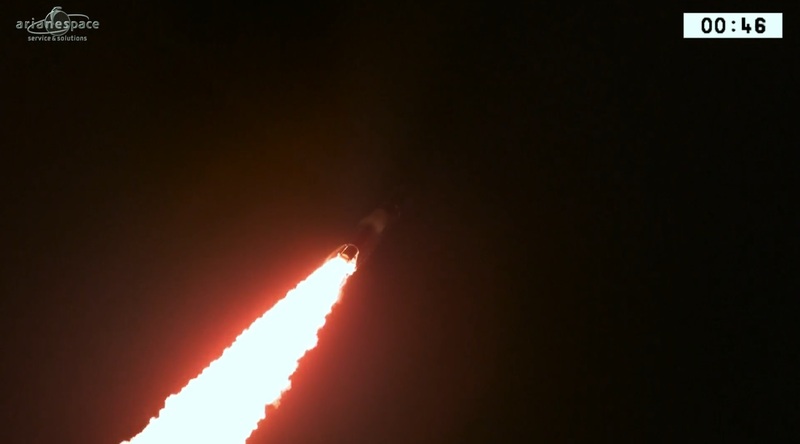 Hauling nearly eleven metric tons into a Geostationary Transfer Orbit, Ariane 5 successfully dispatched the ViaSat-2 Internet satellite and Eutelsat 172B tri-band communications craft to check off the rocket’s 79th successful flight in a row. Thursday’s mission tipped the scales in twofold sense – marking the heaviest commercial Geotransfer mission with a total payload mass of 10,865 Kilograms and eclipsing any previous commercial space launch to date with a total cost of around $1 billion, taking into account the two satellites and the procurement cost of the Ariane 5 launch vehicle. The 55-meter tall rocket jumped off its ELA-3 launch pad at the Guiana Space Center at 23:45 UTC, setting sail on a 41-minute mission to dispatch its two passengers into a standard Geostationary Transfer Orbit. Ariane 5 dropped its two Solid Rocket Boosters into the Atlantic just over two minutes after liftoff and the first stage continued firing until the T+9-minute mark when the cryogenic upper stage took over for another 16 minutes of powered flight to reach the planned injection speed of 9.4 Kilometers per second. 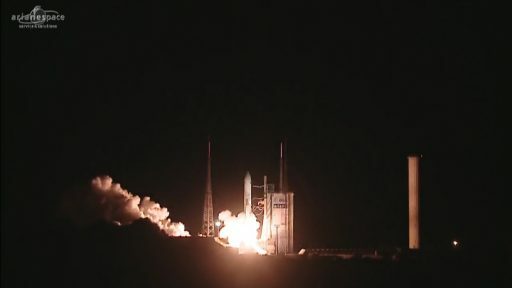 ViaSat’s new flagship was first to separate from the launcher, heading off to become the world’s highest capacity satellite, beaming Internet services to millions of homes and businesses in North America and airline passengers over the Atlantic Ocean. Eutelsat 172B, riding in the lower payload slot, was pushed away from the second stage 41 minutes into the flight, becoming the first all-electric GEO satellite built in Europe to reach orbit, joining Eutelsat’s 40+ satellite fleet. Thursday’s Ariane 5 launch was the first of four Arianespace missions planned in the space of eight weeks to allow the company to catch up with its planned 2017 manifest after operations at the South American launch base were forced to a halt in March and April by a general strike in the small French department. Taking advantage of a planned gap in launches, Arianespace re-aligned the three missions affected by the social unrest to be back on the planned schedule by the end of June. Marking the 289th Arianespace-operated launch and the 93rd for Ariane 5, the VA237 mission carried two landmark satellites – ViaSat-2 as the new-record holder for data throughput and Eutelsat 172B as the first all-electric GEO satellite delivered by Airbus Defence and Space. ViaSat, based in California and founded in 1986, aims to make the Internet available and affordable across the globe by parking a series of high-throughput satellites in Geostationary Orbit. Initially building a reputation for ground-based infrastructure like satellite Internet modems and IP Terminals, ViaSat acquired its first two satellites in 2009 when absorbing Internet provider WildBlue. ViaSat-1 launched back in 2011 and, at the time, set the new record for a throughput capacity in excess of 140 Gigabits per second. 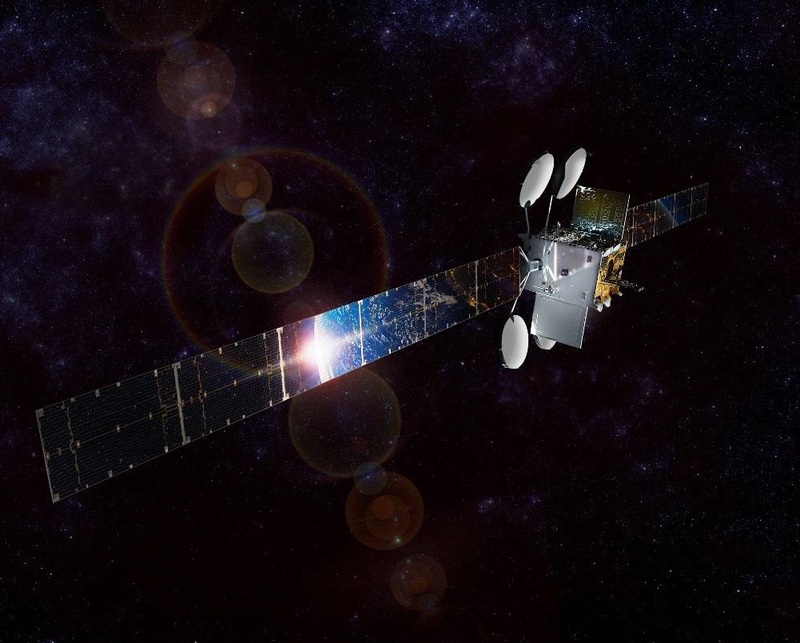 The ViaSat-2 satellite will double ViaSat-1’s capacity and expand its coverage area by a factor of seven – delivering 300Gbit/s of capacity to users all across North America and covering a large stretch of the Atlantic for aeronautical and maritime connectivity. Built by Boeing Space Systems based on the high-power version of the BSS-702 platform, ViaSat-2 weighs 6,418 Kilograms at liftoff and, once fully deployed in orbit, will span 48 meters with two large solar array wings generating over 18 Kilowatts of power to operate the craft’s Ka-Band payload. The satellite will be located at 70 degrees West in Geostationary orbit for an operational life of over 14 years. The $625-million ViaSat-2 project is the company’s second step toward establishing a global Internet constellation that will be realized with ViaSat-3 – a fleet of three Terabit-per-second satellites creating full global coverage at unprecedented capacity, currently targeting launch in 2019/2020. Bolted on top of the Ariane 5 second stage, Eutelsat 172B enjoyed a ride to orbit in the lower passenger position – an unusual setting for a Eurostar-3000 satellite, enabled through its latest evolution known as EOR – Electric Orbit Raising that reduces the satellite’s mass from six to around 3.5 metric tons by purely relying on ion propulsion instead of a hybrid design with bi-propellant main propulsion system. A trend toward all-electric satellites emerged only in recent years after Boeing debuted the BSS-702SP platform as the first all-electric GEO satellite bus. Electric propulsion is much more efficient than traditional rocket engines in terms of impulse, meaning ion thrusters can accomplish a specific change in a satellite’s speed with much less propellant than a chemical thruster, permitting a significant mass reduction. However, electric propulsion only achieves a fraction of the thrust of a traditional engine – requiring lengthy periods to achieve a planned delta-v.
Airbus Defence and Space introduced the EOR version of the Eurostar-3000 in 2014, using PPS5000 propulsion modules developed over the previous decade based on a lower-performance design. Through performance optimization and thrust vector control, Airbus managed to cut the expected transit time into Geostationary Orbit to under four months for the operational EOR version, hoping to create a competitive platform on the commercial satellite market. 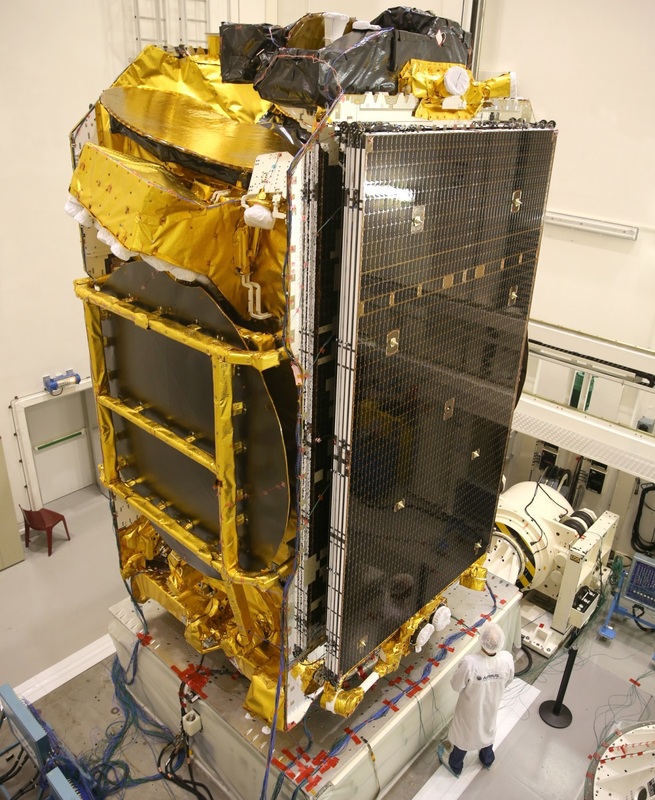 The 3,551-Kilogram Eutelsat 172B satellite carries a tri-band communications package with 14 C-Band transponders, 36 Ku-Band transponders and a 1.8Gbit/s high-throughput payload generating eleven high-power Ku-Band beams. Parked at 172 degrees East where it replaces Eutelsat 172A, the craft will deliver in-flight and maritime connectivity via the HTS transponders, cellular backhaul, corporate networks, video distribution and government services over a large coverage zone from the West Coast of the U.S. across the Asia-Pacific Region. Standing ready for a post-sunset liftoff, Ariane 5 entered countdown operations at 12:22 UTC on Thursday with activation of the launcher at T-10.5 hours to go through a multi-hour checkout period before being cleared for propellant loading. The two-stage stack entered cryogenic tanking at T-4 hours and 38 minutes on the 30.5-meter tall first stage followed 70 minutes later by the ESC-A second stage to transfer around 184 metric tons of Liquid Oxygen and Liquid Hydrogen to the launcher for consumption in a period of 26 minutes during flight. 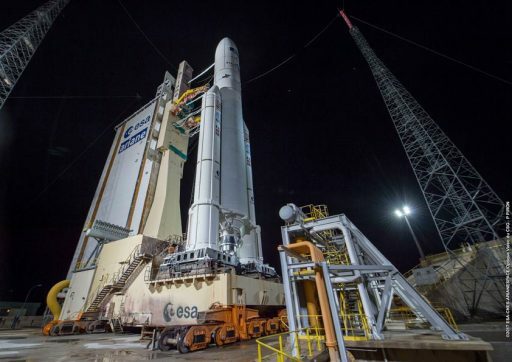 With the rocket fully-fueled and in stable replenish, launch controllers repeated a series of communication checks, switched the two satellites to battery power and verified final status of all support stations to clear Ariane 5 for its Synchronized Sequence. As computers took control of the countdown at T-7 minutes, Ariane 5 went through dozens of steps to transition to a fully autonomous launch configuration. Loading of commodities closed out ahead of pressurization of the 5.4-meter diameter propellant tanks, onboard computers were configured for flight and Ariane 5 went to internal power. The retraction of the two cryogenic feed arms marked the start of the irreversible sequence leading up to ignition of the Vulcain 2 main engine when clocks hit zero. 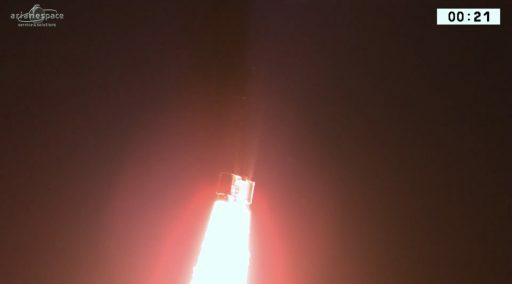 Computers watched over Vulcain as it throttled up to a liftoff thrust of nearly 100 metric ton-force to ensure it was up and running before igniting the twin Solid Rocket Boosters – marking the point of no return for the Ariane 5 at 23:45:07 UTC. Lighting up the night, Ariane 5 climbed away from its equatorial launch base in a vertical posture for just six seconds before entering the pitch and roll maneuver that aligned the vehicle with a departure path due east, beginning a fast overflight of the Atlantic Ocean. Arcing into partly cloudy skies over its equatorial launch site, Ariane 5 reached the speed of sound within 49 seconds of liftoff, relying on its boosters to deliver over 90% of the rocket’s total thrust of 1,420 metric-ton-force. The launcher dropped the boosters two minutes and 22 seconds into the flight, having reached a speed of two Kilometers per second and an altitude of 70 Kilometers. With the boosters gone, Ariane 5 relied on its Vulcain 2 engine alone, guzzling down 300 Kilograms of supercold cryogenic propellants per second to generate 136,000 Kilogram-force of thrust when flying through the rarefied upper atmosphere. 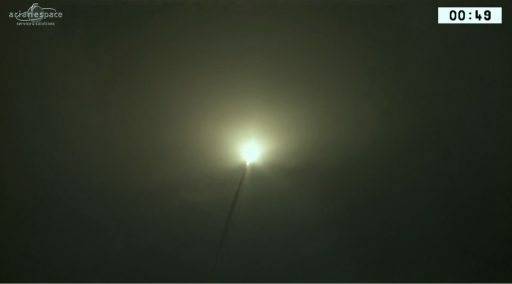 As soon as the rocket had left the discernible atmosphere, it separated its 17-meter long payload fairing, revealing the 6.5-meter tall ViaSat-2 satellite, the larger of the two passengers, while Eutelsat 172B remained shrouded underneath the Sylda adapter. The first stage shut down its engine just shy of T+9 minutes, reaching a speed of 7.0 Kilometers per second and placing the stack on a sub-orbital arc peaking at 160 Kilometers. Stage separation occurred shortly after shutdown, clearing the way for ignition of the ESC-A’s HM-7B engine on a burn of 16 minutes and 21 seconds to push the stack into orbit. The two satellites received a smooth ride on the rocket’s second stage, generating 6,400 Kilogram-force of thrust to accelerate the stack to an injection speed of 9.4 Kilometers per second. The VA237 mission aimed for a highly elliptical orbit of 250 by 35,706 Kilometers, inclined 6.0 degrees to the equator – taking advantage of the low-latitude launch site to deliver the satellites to a minimal orbital inclination. 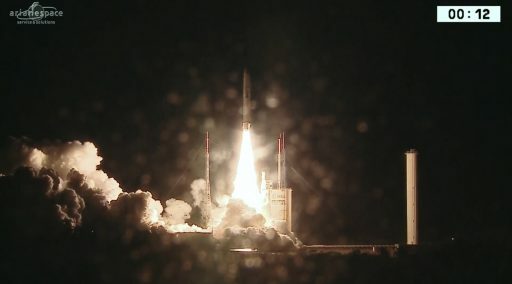 Arriving in its target orbit, Ariane 5 traded the raw power of its main engine with the precision of its cold gas thrusters to set up for the separation of the two payloads. 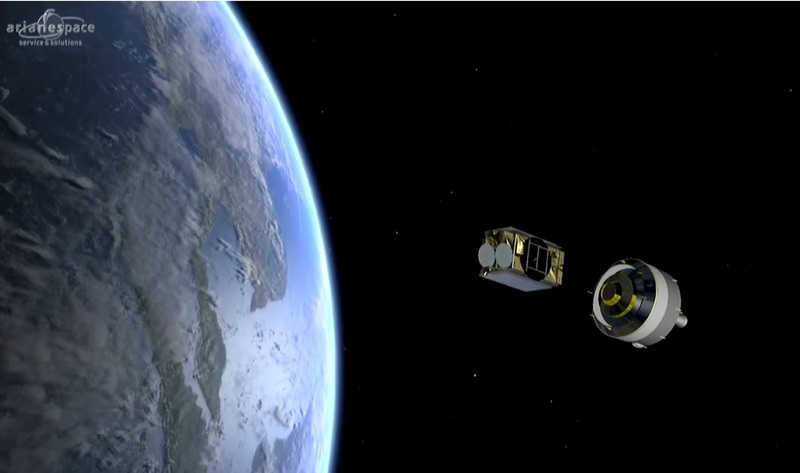 ViaSat-2 departed the upper stage 29 and a half minutes after launch and the ESC-A slewed to a different orientation for the jettisoning of the Sylda adapter two minutes later followed by another ten minutes of maneuvering to set up for the release of Eutelsat 172B on its 15-year mission that starts with an extended period of orbit-raising. Having lifted a record-setting payload into Geostationary Orbit, the second stage concluded its mission with passivation maneuvers – adding another success for Ariane 5 in a streak that has been going since 2003. 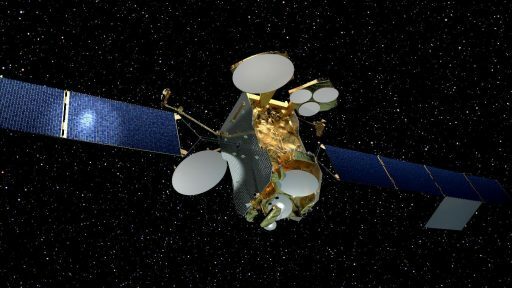 Arianespace plans to follow up on the VA237 mission within four weeks with Ariane flight VA238 carrying the Inmarsat-S/HellasSat-3 and GSAT-17 satellites into orbit, currently targeting a June 28 liftoff.